Social Media Marketing – it’s not just a passing fad: it is the go-to platform for reaching new and existing customers. With marketing professionals providing clients with advanced social and mobile media analytics, businesses, large and small, can finally see their return on investments growing, as they keep their customers happy and connected. Chris Kyricou from Social Media Today has more. Twitter – Facebook – Pinterest – WordPress -Are you ready to up your game online? 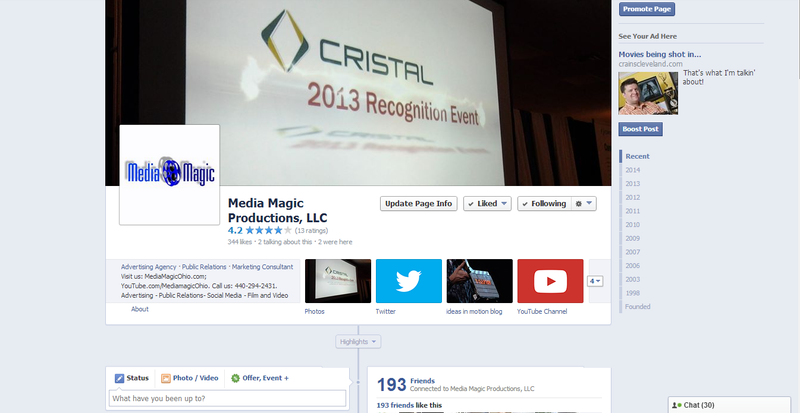 Contact us today… we’ll help you put the Media Magic in your Social Media and Mobile Marketing Strategy! Get Ready: Facebook is releasing a re-design of its business pages. Yes, it’s a pain, but it is also a great opportunity for you and your small business to freshen up your brand’s social media presence. Here is a quick overview of what you can expect. 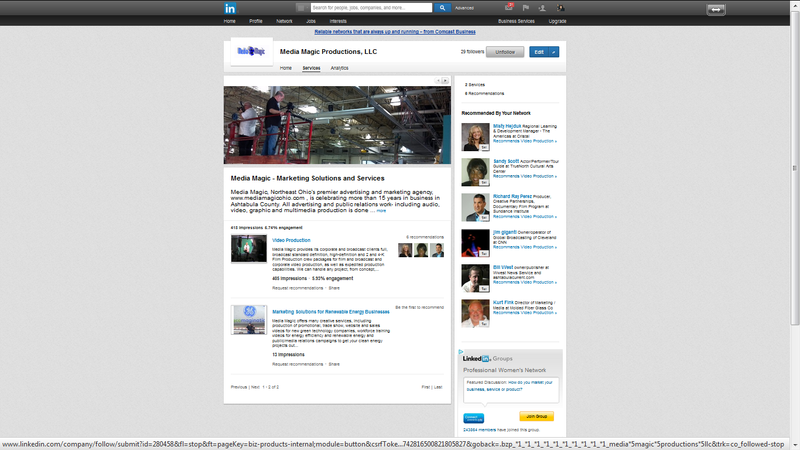 By the way, Twitter and LinkedIn are also making big changes to their company page layouts. Check back this week for all the details. Do you need assistance updating your company’s Facebook, LinkedIn or Twitter Pages? Contact us… we make it easy and affordable! Media Magic #SocialMediaMarketing – Blue Light Special- Extended one week – Offer Ends at Midnight, Monday, April 7th! Attention Business Owners, Not-For-Profits and Artists – OUR OFFER HAS BEEN EXTENDED FOR ONE MORE WEEK!!! Media Magic is offering a Blue Light Special on our Social Media Marketing and Social Media Marketing + WordPress Blog Site Packages – One Week Only! Package #1 Regularly $1,000, blowing it out ’til 12am Monday April 7th for $500!!! Includes design or re-design and content creation for a business or artist Facebook Page, Twitter Page, LinkedIn Company Page with up to 3 Company Showcase Pages and a Pinterest Page. Package #2 Regularly $2,500, blowing it out ’til 12am Monday April 7th for an incredible $999.00!!! Includes a WordPress Blog Site from one of our existing template designs, with up to five static website pages, plus design or re-design and content creation for a business or artist Facebook Page, Twitter Page, LinkedIn Company Page with up to 2 Company Showcase Pages. Only four of the specials will be available this week- first come, first served and 50% deposit must be made by midnight Monday morning April 7th..We accept PayPal and Square, for credit cards. Social Media Sites will be ready to launch seven days from sign-up. Private message me or call 440-645-9472 or 440-294-2431, for more details and to reserve your marketing services. Don’t Wait! Take advantage of this special deal to Spring into April with Online Marketing Firepower from Media Magic! Hard up for content for your small business Facebook Page updates? Social media marketing does not have to be hard work. Try these tips for easily creating engaging messages to your fans… they work for Twitter and LinkedIn, too.Write them up in advance… use them throughout the week and let the ideas flow! Is Valentine’s Day too soon to launch your Mother’s Day marketing strategy? Happy Valentine’s Day, everyone! It’s a beautiful, snowy day here in Ashtabula County, Ohio. With St. Patrick’s Day shamrocks and green apparel already crowding out Cupid’s chocolates at the local pharmacy, you might be asking yourself, isn’t it too early to starting your marketing campaign for St. Paddy’s Day? How about Mother’s Day? Maybe not. Check out the metrics in this article, brought to my attention by David Landis of Landis Communications: When should you roll out your holiday marketing strategy? Got Postcards? Here’s A Direct Mail Marketing Deal ! Are you looking for an easy and cost effective way to use Postcards to market your business? I came across this solution while reading a response by Barry Caputo of the Marsid M and M Group, in a popular marketing blog. He suggested using a service by the USPS called E.D.D.M. (Every Door Direct Mail). EDDM lets you pay a flat fee to mail a large postcard without the need for a mailing list. Just have the postcards printed and bundle them according to postal regulations (bundles of 100 pieces) and take them to the post office. I checked it out for myself. For instance, I went to the map on their site, selected my select target area in Ashtabula and picked two particular routes: one going therough the central business district and one going through the main industrial district. The total delivery cost was $185 – not bad, for hitting every door and PO box in that area. Thanks, Barry for this great marketing tip! You can find out more here about EDDM at the USPS website: https://www.usps.com/business/every-door-direct-mail.htm. Weeks and weeks of Polar Plunges and Snow Storms is giving a lot of us small business owners Extreme Cabin Fever! If you are like me, in beautiful southern Ashtabula County, Ohio, you are tired of being cooped up inside, waiting for Mother Nature to ease up. What I’m doing is taking some time to do what I do for others… market my own business! This slow time is a great time to focus of getting the word out about your company. Try out a new marketing tool – start a new Twitter Hashtag campaign, get started on a new WordPress blog site, upload some product pictures to your Facebook Page or create a LinkedIn Company Page for your business. LinkedIn has some wonderful new tools in its networking arsenal and I am having a lot of fun putting them to work for Media Magic right now. It’s keeping my mind busy and I don’t have time to think about the snow piling up around my window sill. Take a peek at ours below. Check back later this week, and I will have a mini-tutorial about how to get started with LinkedIn Company and Showcase Pages.